In A Vase on Monday – Contrasting Elements. I had to bundle up to wander outside today. We are having winter today, when I woke up this morning the weather said it was 47 degrees (F) and felt like 37. There is also a gale warning and the wind blowing in from the north off the Atlantic Ocean is cold in January. The plants seem perfectly content in the breezy cool, thus far and it always surprises me what I find when it seems not much is flowering. Since I started with orange Firebush flowers I remembered a professor from design school saying you always need a color jump (jump being from one side of the color wheel to the other) in your compositions. My color jump was to the blue Pom Pom Aster. Then I added a pink one and some Tropical Red Salvia. After that the color was getting pretty jumpy so I decided some grey was needed to cool things down. The Flapjack Kalanchoes are blooming and seemed just right. Complicating my mental dilemma was another sacrosanct axiom from design school, all elements must occur in odd numbers. Ones, threes, fives and sevens are best. Fortunately, there were three Pom Pom Asters. A friend from school told me once he thought fours were best when planting a featured perennial because the fourth plant makes your eye go round in circles and focus on the plant. Perhaps my nearsightedness prevents me from perceiving the miracle of four. Finding myself dangerously close to a self inflicted design lecture – I cut some different foliage for contrast. 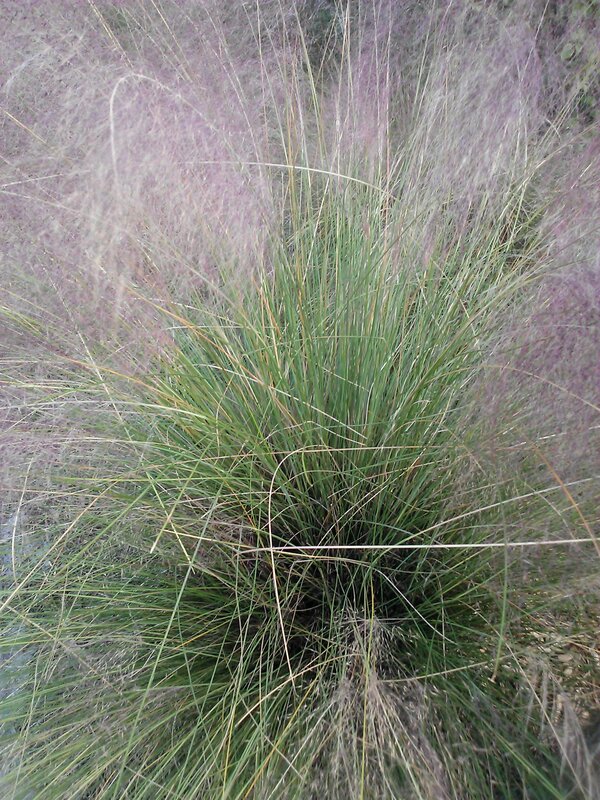 Dwarf Red striped Pineapple, Muhly Grass and Copper Fennel were added, coarse and fine texture and color all at once. Breathing a sigh of relief from all this thought I decided to make lunch. I usually start with one idea and end up with something completely different. After suffering a planting design lecture from myself, I ended up with this. The Orange (called Dwarf Red) Ixoras have started flowering in earnest, so I plucked a few of those and began to make a posy (thank you, Cathy , our meme hostess at ramblinginthegarden) for the new term I love. A posy would be called a bouquet in the US, I can’t speak for anywhere else. My posy just wasn’t working out even though the design principles were solid (more lecturing) fine textured orange contrasting with coarser yellow flowers (Beach Sunflowers) the big coarse purple Solar Sunrise Coleus leaves edged in chartreuse picking up the color of the finer textured Boston Ferns. I give myself a headache thinking about these things sometimes. After the failure of my posy design to gel, caused primarily by structural issues due to poorly considered stem lengths, I sought a small vase for my finely considered composition. The vase was my mothers favorite pansy jar. A none too fine pressed glass jar from God knows where that was frequently filled with pansies in the winter during my childhood. Perfect for oddly too short stems. My mother, not being much of an arranger, would have loved this one. The below photo is my mother (in 1948) overlooking the pansy jar. Pansies in South Florida are an ill considered indulgence. Lasting when temperatures are perfect, maybe two weeks, and requiring more vigilance than I possess I have forsaken them for more tropical flowers. So, no pansies for the pansy jar. But a few new plant friends have been made to grace this heirloom vase. I have been reworking the design of my front yard because the access point for the septic tank was in a lawn area and actually needed access. What this really means is once a year a 3 foot circle in the lawn is dug up and destroyed to clean the (ewww, yes) septic tank filter. The joys of country living. I am certain I did not know septic tanks had filters prior to moving to Florida. I also realized I would like to have a pathway to the side. For many years I have advised my clients to live in their houses for a while to see how they move around the property as sometimes a good guess just really doesn’t do the trick. The upshot is I did not take my own advice and I like to travel to my side garden (ah, future garden) more than I thought I would. Design that originates with how you live in a place is always a good plan. This may be Plan B as I did Plan A. Who knew St. Augustinegrass wouldn’t be happy over a septic tank. Oh, well. I am liking the new bed thus far. A nod to my husbands pie making skills was the purchase of a Piecrust Croton, a multi colored tropical shrub that hails from the South Pacific. These shrubs are easy to grow and ubiquitous in South Florida. There are a few stalwart standby varieties that are common, but of course I love the weird stuff. I love all of these, but I think Stoplight might be the next Croton purchase on my Croton bucket list. How many people have a Croton bucket list? Yes, the beds are getting bigger. The good news is I probably have a quarter acre left!! I think these merit a celebratory Croton in the front yard. Speaking of celebratory, Happy New Year to all. One of my guilty pleasures is watching Foodtv. I have a few favorite shows that are religiously recorded for later viewing, Chopped is one. For those of you not familiar with Chopped, a group of four chefs is given a basket of sometimes bizarre food items – say, venison, gumdrops, cinnamon liqueur, broccoli rabe and rice cereal, then the goal is to make a gourmet three course meal (using the basket ingredients) within a certain timeframe. Other ingredients may be added, but all the basket items must be used. The chef’s food is reviewed on a course by course basis until all but one is left. That chef wins and the rest are chopped. I was standing outside contemplating where to plant the odd assemblage of plants I had acquired when I realized that my garden is a continuous episode of Chopped. My ingredients are plants. 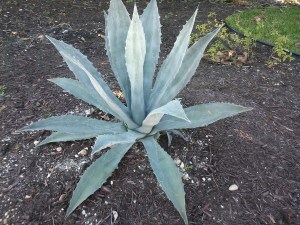 Gardening in Florida adds a few wrinkles to the design process – interesting things just tend to pop up in the garden and there are numerous irresistible plant sales. 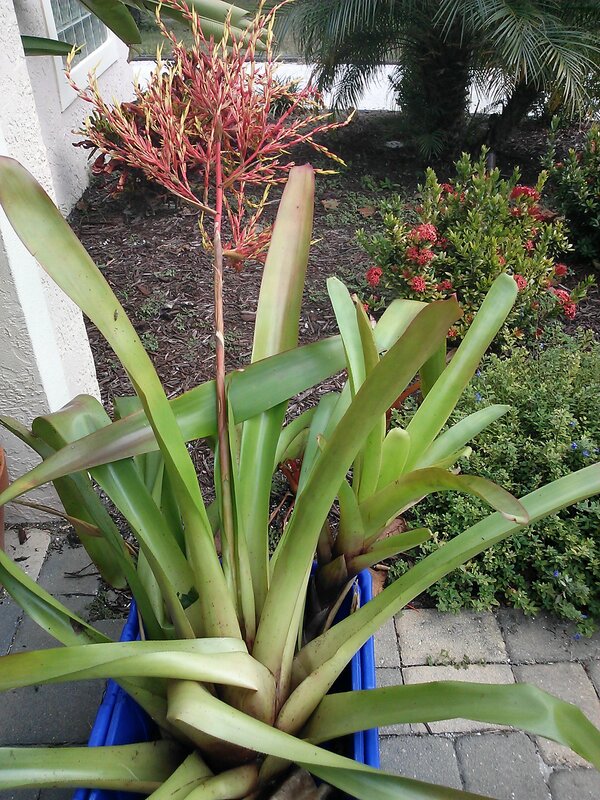 Then a friend or neighbor leaves an interesting plant on the doorstep. It’s a dilemma. After two years of dreadful well water, we joyfully hooked up to our public water system last year. I had left a blank spot down our side property line for the purpose of running the line to our house. After the water line installation was complete the plan was to finish the side landscaping. Life intervened and I had to have hernia surgery. Doctor said in four weeks it should heal. Sounds great, by the way it could take up to six months. It took 5 months, two weeks and then I could move things around in the garden that weighed more than 2 pounds. Things that have just popped up in the yard: Orange Clerodendrum, Pink Pentas, Boston Fern, White Spider Lilies, Pink Rain Lilies and Purple Oyster Plants. A Plant Palette I could not have dreamed up. 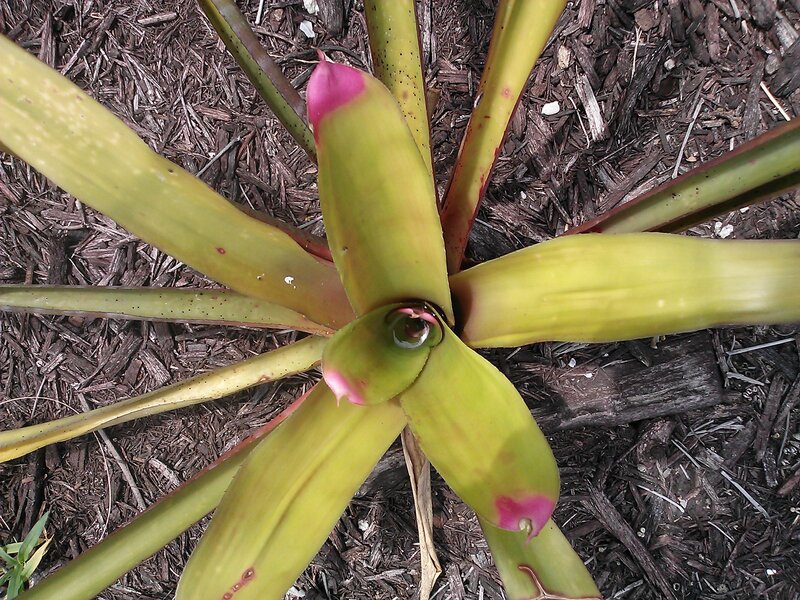 How to combine all of these plants in addition to my usual collection of 5 or so Bromeliads is taxing my brain. It’s a real episode of Gardening Chopped. I hope I make it through the first round. I learned a new term this week: Hellstrip. Hellstrip refers to the baking hot area between the street and sidewalk or driveway. A book has been published about these gardens and there is a Facebook page. Hellstrip has hit social media! Usually narrow and not easily watered these areas require some special consideration and are difficult for gardeners to conquer. I had not realized I even had a HELLSTRIP and the truth is I kind of like it. When my husband and I bought our house there was a Jacaranda in the strip that could literally be seen through. The top of the tree had been blown out and the crotch had rotted to the point you could catch glimpses of the house through the trunk from the street. Fearing an unstructurally sound tree, I had the Jacaranda removed. What grew under the tree might kindly be referred to as sand spurs. The sand spurs took a bit of work to get rid of as nothing really kills them except removal and they reseed heavily. Gallons of vinegar later and with the construction of a new driveway, I had a blank palette. With a bit of research and observation I determined the plant list and began to install. 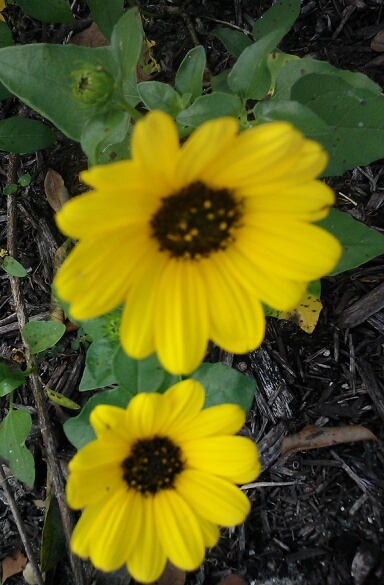 The Sunflowers and Muhly Grass are native, the rest are imports that are very drought tolerant. 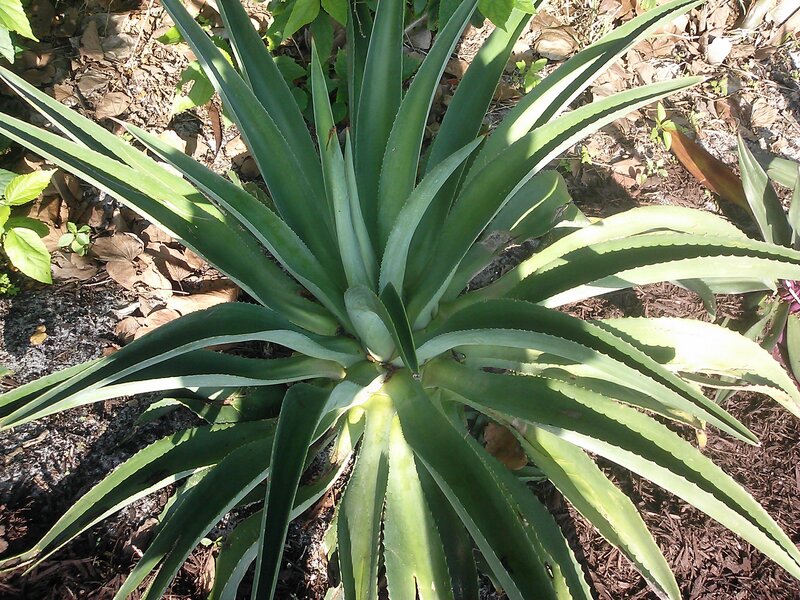 Worst comes to worst, I can make some tequila from the Agave.. The composition might seem a bit weird, but I have color year round and throw some water around every now and again. All the plants are doing well, with no irrigation whatsoever and growing in the poorest excuse for soil I have ever encountered. 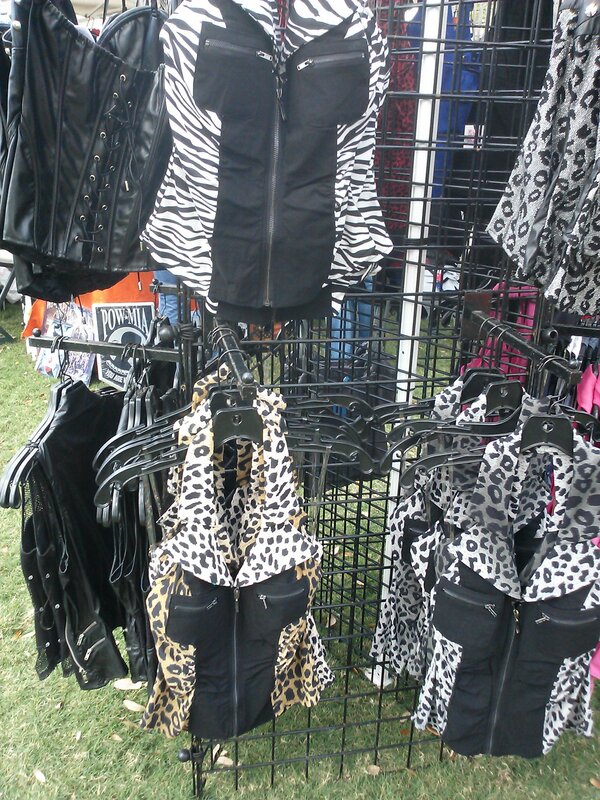 Maybe worn with Combat boots? 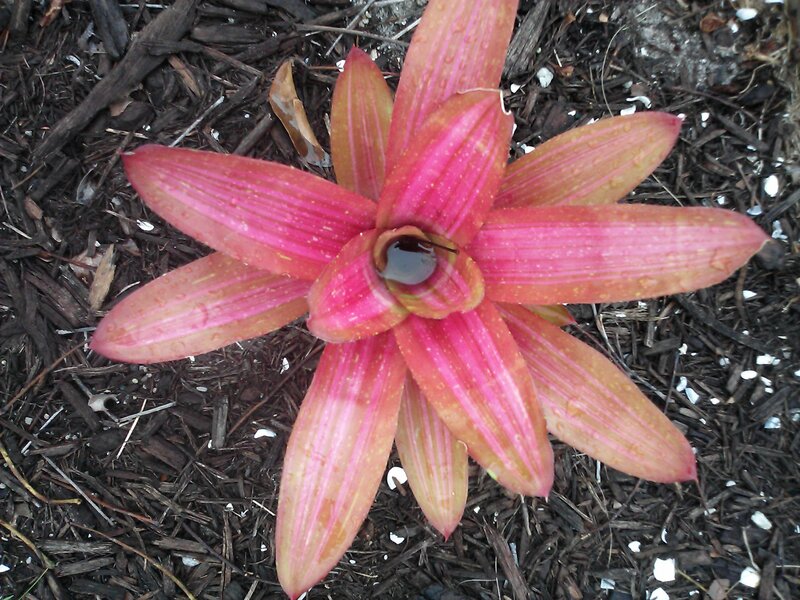 I’ve been meaning to get a tattoo, maybe of my favorite Bromeliad…. 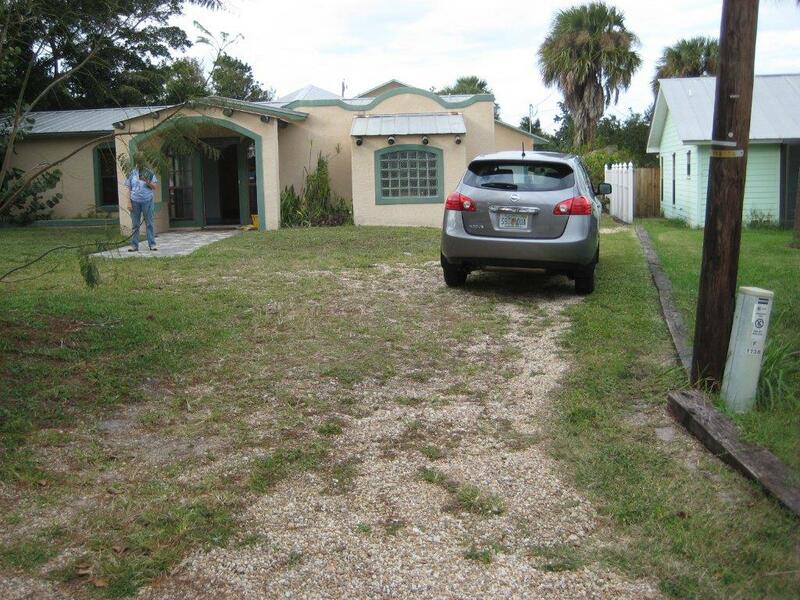 My husband and I bought a distressed property in South Florida. The driveway was really distressed. It took an archaeology dig to figure out where it had been and what it had been. After a bit of detective work we found a ‘Chattahoochee Stone’ pea gravel drive with a turnaround in front of the house. About 70 % overgrown with apocalypse proof weeds. The front yard became a free for all ad hoc parking area. Nobody could tell where they were supposed to park. My husband retired and we decided to forsake the traffic and cold of the big city and moved 600 miles south from Atlanta to South Florida. The namesake of our existing driveway material, the Chattahoochee River, is a major feature in Atlanta. The headwaters of the Chattahoochee are in the North Georgia Mountains, then it winds through Atlanta eventually pouring out into The Gulf of Mexico on the panhandle of Florida. 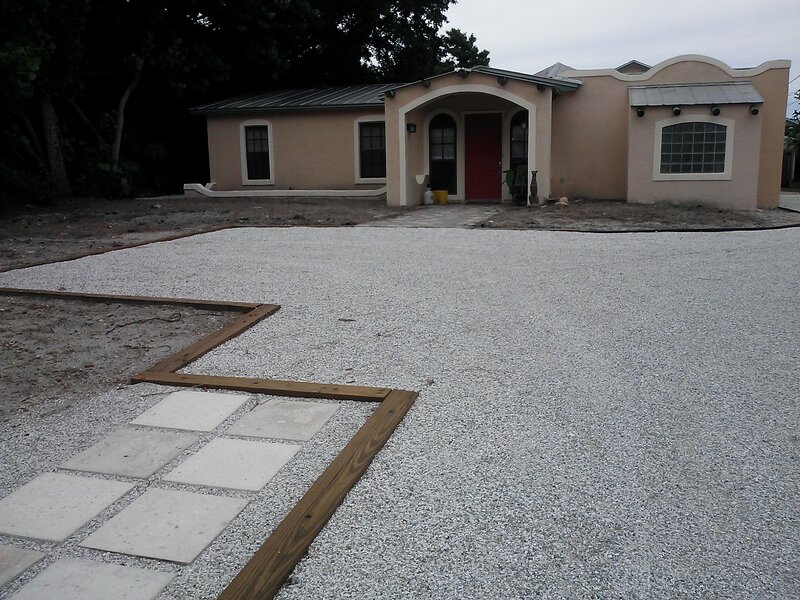 The driveway needed a renovation, however, it seemed a bit ridiculous, not to mention wasteful, to import pea gravel 600 miles to South Florida. Additionally, I was not enthralled with the brown pea gravel, having found it to be a fiesta of weeds in my previous garden and it cost at least 3 times what I had been paying for it in Atlanta. Based on the appearance of the existing drive it was nirvana for weeds. Not a good idea in South Florida. The search began for new material for the driveway. The local rock here is limestone; crushed rock primarily for road construction. The rock is lumpy, starts out white and eventually looks very dirty. I didn’t like this option, but it was cheap. My next thought was pouring a concrete driveway, but, as a Very well seasoned Landscape Architect (yes, I meant to capitalize Very for emphasis) I could tell the drainage just wasn’t going to work. In the event of rain, there would be too much water running off the driveway with nowhere to go. With the exception of the floor of our garage, not a good plan. The driveway needed to be made of a pervious material so the rainwater could soak back into the ground rather than running off. During the course of my concrete drive design/pricing exercise I met a grading contractor who told me it was possible to build a shell driveway. What I couldn’t (and still don’t) understand was why there weren’t any of these driveways around. The only answer is they went out of style. People had been seduced by the evil brown pea gravel from the faraway Chattahoochee River. I can only guess why. I did recall, however, over the course of my career people have waxed on romantically recalling the crunch of the pea gravel in their (perhaps very wealthy and with many yardmen) Grandmother’s yard. This reminiscence is usually related to formal boxwood gardens in the Deep South. They never had to pull the weeds or pay for imported pea gravel. I thought the shell was a great idea and, of course, did a bit of research. The shell used for constructing the driveway is mined about 20 miles north of my house. It is a byproduct of mining sand; five different sizes of material come out of the mine and are used for construction. The sand is used for construction and the shells are sorted out by size and intended use. My driveway is topped with ⅜” graded shell. Grade the area and remove about 5-6’’ depth of existing soil. Compact the existing soil to receive the base material. Provide restraints around edges of driving surface to hold the loose driveway material. My driveway has pressure treated pine timber and Black PVC Landscape edging that act to hold the shell in place. I have seen drives edged with concrete curb or pavers set in mortar. This looks great and is, of course, a lot more expensive. French drains were installed under the driving surface in areas where the water collects as it drains off the roof during a large cloudburst. Another South Florida peculiarity, no gutters, but some scuppers…you must cope with whatever comes off the roof, wherever it comes off the roof. Fortunately, I like rocks and Rain Gardens. The drains were made from old solid walled laundry baskets with the bottoms removed then the contractor dug holes and placed them underground, filled them with gravel and topped the whole thing with filter fabric. The old gravel from the existing driveway was reused to fill the drains. To build the driveway a 2-3” layer of crushed shell (this looks like coarse sand) is laid on top of the existing soil and pressed into place with a Bobcat. This is topped by a 2-3” layer of shell placed with a Bobcat and pressed evenly. The crushed shell course binds to itself and creates a pervious base layer. The shell course provides the driving surface. Maintenance requirements are spraying weed killer (I use the non toxic homemade vinegar solution) and raking it out every now and then. The materials firm up a great deal from cars driving on them and rain, but it is still a loose material. I am pleased with the appearance of the shell driveway and it’s functionality. It drains perfectly and looks great. The shell also gives a great local, beachy feel to our property. And it looks really clean. It is also a very sustainable project, the majority of the materials arrived from within 50 miles of my house. The shell is a reuse product from a local mine. The driveway is pervious and most of the stormwater drains back into my property. I have two guest parking spaces and a turnaround for use when backing out of the garage. Pleasing the environment and me.